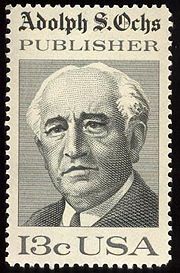 A U.S. Postage Stamp commemorating Ochs. Adolph Simon Ochs (March 12, 1858 – April 8, 1935) was an American newspaper publisher, and former owner of The New York Times. Under his leadership The New York Times became a pre-eminent American daily paper with sales of over one million, and is credited with winning ninety-four Pulitzer Prizes. Contrary to many of his peers at the time, he denounced yellow journalism and sensationalism, concerning himself only with trustworthy reporting and writing. He coined the paper's celebrated slogan, "All the news that's fit to print," widely interpreted as a jab at competing papers. Ochs' success with the Times remains his legacy and his continuing impact on the world. His descendants, members of the Sulzberger family, continue to maintain a dominant role in the operation of the paper and in maintaining its consistently high standard, detailed and broad coverage of international as well as American news. If those who follow Ochs in this field continue to inherit sound moral principles from their family and religion, and work with integrity, the world will surely benefit. Adolph Simon Ochs was born on March 12, 1858 to German-Jewish immigrants, Julius and Bertha Levy Ochs, in Cincinnati, Ohio. The family moved south to Knoxville, Tennessee due to his mother's Southern sympathies during the Civil War. His father, however, enlisted in the Union army, causing a strain on his home life. Ochs began his newspaper career there at age 11, leaving grammar school to become a printer's assistant at the Knoxville Chronicle. At the age of 19, he borrowed $800 to purchase a controlling interest in the Chattanooga Times, becoming its publisher. In 1896, at the age of 36, he again borrowed money to purchase The New York Times, a money-losing newspaper that had a wide range of competitors in New York City. His focus on objective news reporting (in a time when newspapers were openly and highly partisan), and a well-timed price decrease (from 3 cents per issue to 1 cent) led to its rescue from near oblivion, increasing its readership drastically. In 1884, Ochs married Effie Wise, the daughter of Rabbi Isaac Mayer Wise of Cincinnati, who was the leading exponent of Reform Judaism in America and the founder of Hebrew Union College. Their only daughter, Iphigene Bertha Ochs, married Arthur Hays Sulzberger, who became publisher of the Times after Adolph died. Their son Arthur Ochs "Punch" Sulzberger subsequently became publisher of the Times and daughter, Ruth Holmberg, became publisher of the Chattanooga Times. 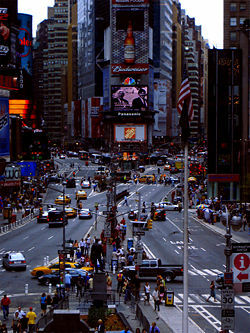 In 1904, Ochs moved the Times to a newly-built building on Longacre Square in Manhattan, which the City of New York then renamed as Times Square. On New Year's Eve 1904, Ochs had his new building illuminated with a fireworks show from street level. Adolph Ochs died on April 8, 1935 in Chattanooga, Tennessee, the birth place of his newspaper career. One of his nephews, Julius Ochs Adler, worked at the Times for more than 40 years, becoming general manager in 1935 after Ochs' death. Adolph Ochs started at the Knoxville Chronicle as an office boy when he was 11, and at 13 he became an apprentice. In 1877, Ochs joined in a fruitless effort to establish the Chattanooga Dispatch. A year later, the owner of the Chattanooga Times was in financial straits and offered to sell to Ochs, then not old enough to vote. On July 2, 1878, with $37.50 working capital, Ochs became publisher of the Chattanooga Times upon handing over $250, which he had borrowed, and assuming $1,500 in debts. He showed a profit the first year. In 1892, Ochs built the Chattanooga Times Building, an outstanding addition to the developing city. In 1896, Ochs acquired control of the New York Times. He mortgaged and risked everything to "conduct a high standard newspaper, clean, dignified and trustworthy." The New York Times followed the slogan "All the News That's Fit to Print." His tactics involved rejecting the yellow journalism and sensationalism that was typical of his contemporaries, such as Joseph Pulitzer and William Randolph Hearst, and report news only that was true and verified. When he acquired the paper, it had less than ten thousand readers. From 1896 to 1935 he raised the daily circulation enormously, and by the 1920s, the newspaper had nearly eight hundred thousand readers. In the early 1900s, Ochs moved the newspaper's operations to a new skyscraper on 42nd Street in Longacre Square. Ochs persuaded Mayor George B. McClellan, Jr. to construct a subway station there, and the area was renamed "Times Square" on April 8, 1904. Ochs utilized new technology to circulate the paper to many areas outside of New York, and in 1904 the paper was responsible for the first on the spot wireless transmission of a naval battle, depicting a skirmish during the Russo-Japanese War. The New York Times moved to more spacious offices across Broadway in 1913. The old Times Building, now known simply as One Times Square, remains famous for the "ball" which "drops" from a tower on its roof every New Year's Eve. Ochs started the Sunday book supplement within ten years after taking over. In 1913 he began publishing the New York Times Index. In 1925 Ochs started advancing fifty thousand dollars annually for ten years toward the cost of producing the Dictionary of American Biography, a book featuring the biographies of prominent Americans. He established Current History Magazine in 1914, a journal originally created to provide coverage of World War I. From 1900 until his death, he was a director for the Associated Press. Ochs also controlled the Philadelphia Times and the Philadelphia Public Ledger, which he merged and in 1913 sold to Cyrus H. K. Curtis. Curtis merged sections of this acquisition with The Philadelphia Inquirer, which remains one of Philadelphia's most prominent newspapers. The most important enterprise of Ochs' life was his recreation of the New York Times. Ochs' business tactics of steering away from sensationalist news and lowering the price of the paper, as well as relying on the rise of technology, gave a new breath of life to the ailing paper. To this day, the descendants of Ochs still maintain control over the paper, and it has become a pre-eminent American daily paper with a daily circulation of well over one million. It has won ninety-four Pulitzer Prizes, including a record of seven in 2002 alone. His expertise also helped the Chattanooga Times in Tennessee emerge out of its financial deficit and become a well circulated paper. Today, it is merged under the name Chattanooga Times Free Press and remains in circulation. He also owned newspapers in Philadelphia which today have become part of the Philadelphia Inquirer, a reputable newspaper with a long and rich history. His influence also helped establish Current History Magazine, which is still published today, and the Dictionary of American Biography. I inherited good health and sound moral principles; I found pleasure in work that came to my hand and in doing it conscientiously; I found joy and satisfaction in being helpful to my parents and others, and in thus making my life worth while found happiness and consolation. My Jewish home life and religion gave me a spiritual uplift and a sense of responsibility to my subconscious better self—which I think is the God within me, the Unknowable, the Inexplicable. This makes me believe I am more than an animal, and that this life cannot be the end of our spiritual nature. ↑ 1.0 1.1 1.2 Gerald W Johnson, An Honorable Titan: A Biographical Study of Adolph S. Ochs (Harper and Brothers, 1946, ISBN 978-0837138367). ↑ 2.0 2.1 American Jewish Historical Society, Adolph Ochs Jewish Virtual Library. Retrieved March 21, 2019. ↑ 3.0 3.1 Gay Talese, The Kingdom and the Power: Behind the Scenes at The New York Times: The Institution That Influences the World (Random House Trade Paperbacks, 2007, ISBN 978-0812977684). ↑ Susan Tifft and Alex Jones, The Trust: The Private and Powerful Family behind The New York Times (Diane Pub Co., 1999, ISBN 978-0756787127). ↑ Obituary The New York Times, April 9, 1935. Retrieved March 21, 2019. All links retrieved March 21, 2019. Obituary: "Adolph S. Ochs Dead at 77; Publisher of Times Since 1896" New York Times, April 9, 1935. This page was last modified on 21 March 2019, at 14:52.